What do all the White House resignations mean? US National Security Adviser Gen James Jones is the latest in a growing number of high-profile officials trickling out of the White House. In recent weeks three of President Barack Obama's top economic advisers - Larry Summers, Peter Orszag and Christina Romer - announced their departures. 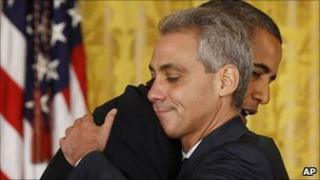 And of course chief of staff Rahm Emanuel, a larger-than-life character in the tableau of Obama advisers, abruptly left his post to launch his bid to be mayor of Chicago. Senior adviser and longtime confidant David Axelrod is openly preparing an exit path, telling reporters he plans to return to his hometown of Chicago next spring to work on Mr Obama's re-election. These White House exits come at a time when Mr Obama is struggling to lift his approval ratings out of the doldrums. The economic recovery is anywhere from slow to stagnant, depending on which economist is opining. The number of unemployed Americans continues to rise. So is this a case of rats fleeing a sinking ship? Most presidential watchers say no. Gen Jones's departure, for example, was widely expected. It was well-known in Washington circles that he was a poor fit in the tight-knit administration. Moreover, working in the White House is a gruelling experience at the best of times. "These are tough jobs and they are incredibly taxing," Professor Marc Selverstone, assistant director for presidential studies at the Miller Center for Public Affairs, told the BBC. The hours are long, the spotlight intense and the criticism seemingly never-ending, particularly in the age of the 24-hour news cycle and hotly politicised media outlets. Mr Obama's advisers entered the White House at a particularly difficult moment in history. They had to manage the biggest economic crisis in decades and two wars. Some level of burn-out - particularly among the economic advisers - is to be expected. Mr Selverstone does not think the turnover is all that unusual. "Reagan went through six national security advisers before his eight years were over and George W Bush had one each for his two terms," he said. "As far as these two administrations were concerned, general stability in that position doesn't necessarily correlate with impressions of their relative success in foreign policy." Similarly, chiefs of staff rarely last a full term - President Clinton and President Reagan each went through four of them and President George HW Bush had three in just one term. "It's hard to tell what it portends regarding the success of the administration," Mr Selverstone said. "There was relative stability at the top of the Bush administration and clearly there were successes and failures there." Who has left the White House so far?